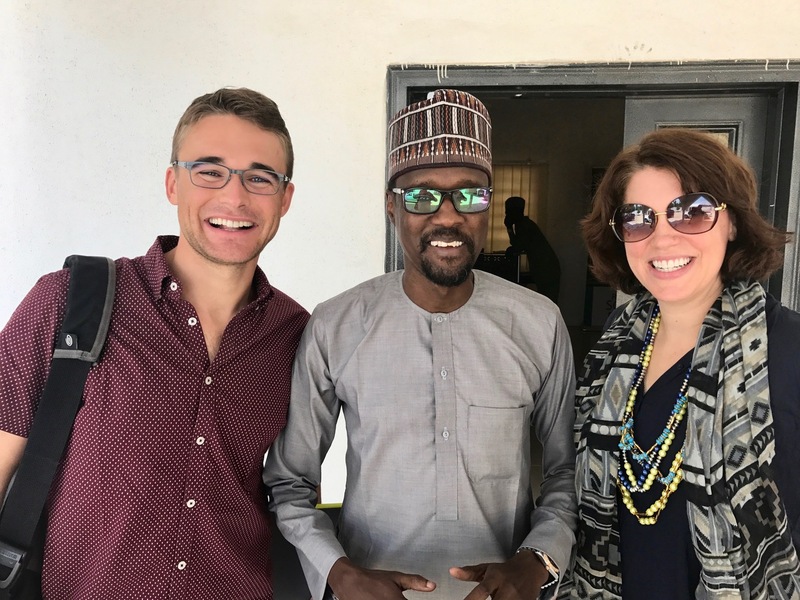 Alexa arrives in Maiduguri, Borno State, Nigeria where her team embedded with NERI and interviewed a number of local civil society organizations (CSOs), academics, and members of the Civilian Joint Task Force (CJTF) as part of Frontier’s research. Running her own business is liberating for Alexa Courtney, the founder and CEO of Frontier Design Group, which is based in Arlington, Virginia and is a USAID implementing partner. However, she did not start out on a traditional entrepreneurial path. She began her career as a federal civil servant — including time at USAID and the U.S. Department of Defense (DoD) as a conflict specialist and civil-military advisor — but yearned for something different. When she returned from an assignment at USAID’s Afghanistan mission, Alexa says a senior leader at the U.S. State Department asked her how the Agency was adapting the way it does business to environments like Afghanistan and Pakistan. “I quickly realized that I needed to cultivate new knowledge and skill sets to answer that question effectively, ” she said. She left the federal government for the private sector, consulting for U.S. Special Operations Command and honing the skills she gained during her field experiences in Afghanistan. But life took a different turn where she could be her own boss. On September 21, 2015, International Peace Day, Alexa took the plunge and started Frontier, a human security strategy and design firm that builds new collaborative approaches to help USAID, DoD, and U.S. Department of State engage more effectively in conflict-affected countries to prevent crisis and terrorism. Today Frontier works on some of the most critical national security questions: How do you design government entities that can innovate and adapt faster than ISIS? How do you prioritize investment in fragile states? What are the metrics of cost effective CVE programs? “Frontier believes that everyone has a fundamental right to live free from violence and the fear of insecurity,” says Alexa, who believes the nation’s development strategy must evolve just as the threats to national security are evolving. Alexa and Justin with a member of the NERI team in Maiduguri. USAID continues to prioritize support to scores of entrepreneurs and small businesses like this one. While the Agency highlighted these efforts work at last year’s Global Entrepreneurship Summit in Hyderabad, India, this work has been happening for decades. In fiscal year 2017, the Agency awarded a record 13.12 percent, or over $634.3 million, of total acquisition dollars to U.S. small businesses, exceeding the Agency’s goal of 11.5 percent. USAID awarded $184.5 million awarded to women-owned small businesses. Additionally, in 2017, USAID issued 12.69 percent of its total prime contract dollars to small businesses. Not only has the Agency focused on meeting its worldwide small business goal for all small business categories, it also works towards increasing prime and subcontract opportunities for women-owned small businesses. Frontier has worked with USAID’s Global Development Lab and conducted a case study on the Office of Transition Initiatives’ countering violent extremism (CVE) programming in northeast Nigeria. The study aimed to observe, assess, and document organizations that operate in complex and insecure environments. The company has also worked with the Army Special Operations Forces CVE organizations, the National Counterterrorism Center on new assessment approaches, and Silicon Valley organizations. Alexa describes her business as thriving in a constant state of creativity and possibility; if workers there can dream up an idea and get it funded, they can do it. The endless possibilities are incredibly energizing, but also come with hard work and long hours. “Fortunately, everyone here is having fun together and learning from each other. We are alums from USAID, State, USIP and industry. We’re an eclectic crew but we are deeply motivated by the meaningful work of our clients and partners,” Alexa said. About the Author: Scott Hochenberg is a Program Analyst in USAID’s Bureau for Legislative and Public Affairs. Learn more about USAID’s Office of Small and Disadvantaged Business Utilization and how to contact these offices. Download the second episode of the Agency’s podcast, USAID Leads, to hear Administrator Mark Green explain USAID’s importance to U.S. national security. You can listen and subscribe through your favorite podcast apps. Or you can listen online here.